PRICE REDUCED!! BRAZILIAN BUFFET STYLE RESTAURANT FOR SALE. OPEN SINCE 2000 LONG STANDING PART OF COMMUNITY. WELL KNOWN FOR ITS LUNCH BUFFET. CAN OPEN FOR BREAKFAST AND DINNER AND TRIPLE INCOME. Latin American Restaurant located in busy neighborhood plaza. Seating capacity 60. Full equipped kitchen with hood, walking cooler and freezer. Beer and wine license in place. Turn key restaurant opportunity. Lots of deliveries in the area. Sold as asset sale. Good for owner operator/ family. Turn key Restaurant. In an effort to respect the privacy of the owner and patrons, please refrain from contacting any of the employees or owners. Confidentiality agreement required. NEW PRICE DROP TO SELL FAST. The Seller needs to relocate to Europe. Asset Sales. Attractive Restaurant on Prime Location in Downtown Miami. Fully Equipped Kitchen with 9ft Hood. Serves Mediterranean and French Cuisine. The Restaurant is Open for Lunch and Dinner, with also a Growing Take-Out and Delivery Activity Due to Strong Growth of Downtown and Brickell Areas. All Licenses in Place, including Wine & Beer. Very Competitive and Long Lease ($3,296 /month, CAM & Sales Tax included, 10 years). Possible E-2 Visa with proper Business Plan. Please provide a signed NDA to access info on the name and address of the restaurant. Slip # 54 is a prime dock - can accommodate a 50' boat (55' Boat slip) on the Island with the Beautiful Membership Club House, bath, entertainment area and much more. Owner has paid for 1st quarter as an incentive, ends March 31st. #Windstar is a gated community and convenient to just flow into the Gulf of Mexico. The boat slip is right outside the club house, hurricane hole, best location with a hot tub also. Great Nicaraguan Restaurant serving Breakfast, Lunch, Dinner, and Cantinas in south Dade area. All equipment included in the sale as well as the name of the business. This restaurant was previously known as La Villa Del Pollo, established in 2005. Location is on one of the most trafficked in the area. This new administration has substantially remodeled the restaurant, making it look much better than before. Likewise, brand new pieces of equipment have been installed. Incredible lot in the highly desired golf course community of Country Club Estates. The oversized waterfront .34 acre lot has been completely cleared and positioned at the head of a cul-de-sac. This lot makes for the perfect site to build your dream home! The community offers guard gated security, an excellent golf course w/ amenities, and best of all LOW hoa fees! New home renderings available upon request. All information approx. buyer to do due diligence. Caloosa Preserve: Amazing opportunity to build your dream home on this beautiful riverfront lot that leads to the Gulf of Mexico! Come and enjoy close to 1.5 acres of land! Just 25 minutes "upstream" from Ft. Myers! There is a private boat ramp with 2 docks and a riverfront pavilion that are available to all residents! Ask about the building options in this community! ASSET SALE Fully Equiped restaurant cafe on Biscayne Blvd. Located in busy shopping center. Anchor tenants AT&T, Mattress Firm and Dunkin Donuts. Seats 19 inside, can add some outside seating. Large kitchen, plenty of preparation space and walk in cooler. All permits and licenses in place including Beer and wine. PLEASE DO NOT DISTURB EMPLOYEES. EXCELLENT DUPLEX LOT ! NO LIENS! NO VIOLATIONS! NO OPEN PERMITS ! PRICE TO SELL ! IT WON'T LAST, BEST LOCATION EVER!! FOR SALE AS-IS. THERE WAS A PROPERTY THERE BEFORE. This primetime Downtown Miami location perfectly suited for any business. Located in the prominent corner of Downtown Miami, this location is available for the first time in over 50 years. The property is on the corner of NE 2nd Avenue and NE 1st Street and fronts both well-traveled roads giving it tremendous visibility. Adding to the property's allure is the fact that it is located just one block away from both Biscayne Blvd as well as the First Street Metromover. This is a tremendous opportunity for any business owner/corporation looking to grow their brand. Slip #37. Fantastic opportunity to own a 71’X21.59’ boat slip inside a gated harbor with dock master. The slip is in a pie shaped corner making it huge. The smallest dimensions are the 71’X21.59’, but it opens up from there. See plans in the photos. No bridge, quick access to the gulf. Slip location allows for direct easy in and out docking. Close to the parking lot as well. Quiet, feature packed marina with beautifully kept wood docks, club house with rest rooms, pool, spa, pump out, ice, electric and water to each slip. Gas, diesel, bait, etc located just next door at Hamilton Harbor. Dock master with golf cart keeps things running smoothly. This harbor is a well known hurricane hole dating back to a fish camp from the early 1900’s and is an absolutely terrific place to keep your vessel. You do not have to be a Windstar resident to purchase/use the slip. Slip may be rented out as well. Cape Coral: Wow! Stellar opportunity to own a SOUTHERN exposure DIRECT access lot in the rapidly expanding NW section of Cape Coral, and soon to be home to the Seven Islands Development. Build the home of your dreams and soak up the sun by the pool! Great location, with easy access to Punta Gorda, Interstate 75, Fort Myers, Pine Island, Matlacha and enjoy all that the area has to offer - shopping, golfing and dining just to name a few. Enjoy direct boat access out of your 200ft canal - NO bridges or locks out to the renown gulf waters of Matlacha Pass. Enjoy some of the best fishing SW Florida has to offer, kayaking, paddle boarding, bird watching and sight seeing as the area has a healthy population of wildlife. Come live the Florida dream NOW - this lot won't last long. Green Sub: Duplex in South Miami. 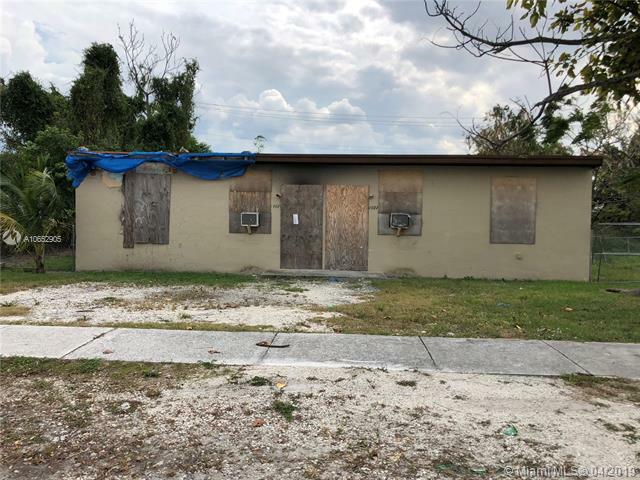 Don't miss out on this excellent investment opportunity in a hot rental area in South Miami. Each unit is a 2/1. Vacant. Market rent is about $1400 for each unit, potential annual gross income of $33,600+. Buy now, benefit from the cash flow and let the property appreciate, best deal in the area. CASH ONLY. The property has violations and open permits and it needs a full rehab, including the roof. Buyer has to be ready to close quick. Lien and title search ready. Please call or text for more questions.